Reports have been good again this week. 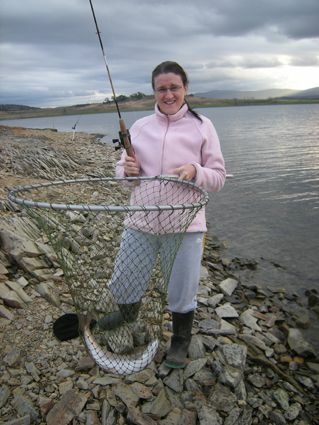 Rivers:-Have been in great condition and the fishing has been excellent. While many of the major streams have produced smaller fish there have been some good sightings of much larger fish in the Thredbo and many seem to be in semi spawn mode. There have been reports of a few browns starting to pair up in the rivers. Next lot of good rain could see a few more fish entering the streams and should be worth a look for some good browns. As an avid voyer of your fishing report I would like to add some of my news. I have had two fantastic trips to the Thredbo recently. The quality and number of trout encountered was amazing. On the first trip I got three big browns of 4lb, 4.5lb and 5.25lb. Plus about six to seven lesser fish including a couple of extremely cunning twelve inch browns that acted like they were ten pounders. All the big fish were caught on a green humpy and all on the first presentation. On the second trip I got one 3lb brown and two really good rainbows that both put on truly epic battles. I guess the they were around the two pound mark. 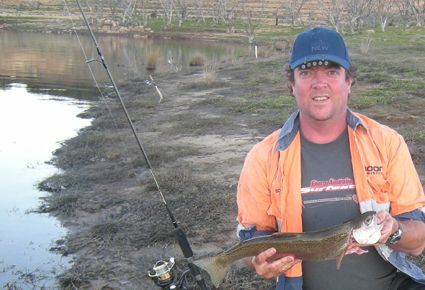 The Thredbo this season has carried some really great fish. I chased one for about an hour that looked about six inches bigger than the average 'big' resident fish. My guess would be about six pounds. Unfortunately, a jumping jack ant entered my trousers via a tear in the shin and I did my best impersonation of a rhino on acid when it bit me. The timing could not have been worse as the one and only oportunity to cast had just presented itself. My sudden explosion of mad leg slapping and dancing on the spot followed by the quick removal of my pants put an end to any chance I had. At least I know here he lives. Lake Eucumbene:- Fly reports have been great over the past week and on the weekend. The evenings and early mornings have been very good though during the day can still be excellent especially with cloud cover or when fishing deep from a boat. Mudeye action has beeen a little quiet although the fish are still eating them fly patterns like them. After dark with a Taihape Tickler or similar pattern should work, but you can also try cubits mudeyes, cordulids and the ever popular hivis mudeye. Black muddler minnows are also great fish takers after dark. Just an update on the fishing on Saturday after swinging by the store to pick up some mudeyes. to see if he felt like coming out for the afternoon. The next three (the three smaller ones at the 1 - 1 1/2 lb size) came in on mudeyes as well to about 6:00 pm. There wasn't much rise activity on the water at all, but I decided to put the fly rod to work with a Woolly Bugger on, and got the second largest rainbow (around 2 lb) at around 6:30. I had a couple of decent hits and then I thought a submerged log had taken hold of my line around 7:15  until the thing decided to go for a swim! If you get any reports about a bloke going off his tree about a big fish on his fly line from Saturday, youll know it was me. it is now on it's way to the smokehouse - it's the second biggest trout I've ever caught and by far and away the best since moving back south. Oh yeah  on the facts front - even though Flynny reckoned he'd hit a purple patch over the last few weeks, the last two times we've been out has seen us with 13 fish between us and at 10 - 3 to me. Small minnows and tassies trolled around the edge are bound to catch a few fish. Fished Euc last week from Tuesday to Friday. Struggled for the first one and a half days with only six fish landed, all were "OK" size rainbows. This was in the Breamer Bay area. We then moved around to Cobrabald Bay and finally found some fish. Ended up with around forty odd fish for the couple of days. First time we had taken the Hobies to Euc and I was very immpressed. Made it very easy to fish certain small areas thoroughly without spooking the fish. We found that the ends of little bays were the most productive places to fish. The fish weren't holding in any particular depth either, we caught them in 2m right out to 8m of water. Best lures for the week would have to be the small CD3 Rapala's, not one particular colour was preffered by the fish, we caught them on bright yellow colours all the way through to black coloured ones. It seemed as though it was the action they preffered more so than the colour. We picked up a few on yellow wing tassies but small minnows were definately more productive. All fish caught were rainbows... whats the trick to stirring up a brown or two? All in all it was a great couple of days and hopefully will be back soon, before it gets too bloody cold. 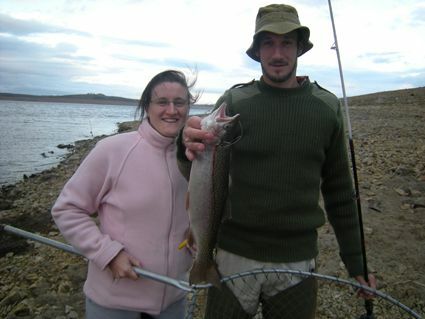 Jindabyne:- Some better reports from Jindabyne this week with downrigging around the ten metre mark being successful. *Lake Jindy is 17 degrees. The mornings are cold and this fishing is so so. Best lure at the moment for me has been the yellow wing freddo. Fish are taking the odd pink lure on the surface but for going deep stick with the freddo. The deeper fish are gorging themselves on the massive clouds of daphnia often spewing up mouthfuls of them when captured. Hence the green lures doing so well. New moon this week should see things improve. The bait fishing in Eucumbene has been very good with mudeyes taking their fair share of fish. Powerbait has also been excellent. Try Springwood, Cobrabald, Buckenderra, Seven Gates, Collingwood and Wangrabelle. 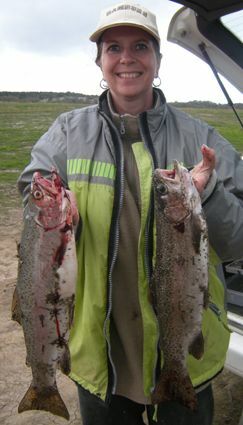 *Tanya Beckman with two nice rainbows caught at Eucumbene on the weekend. 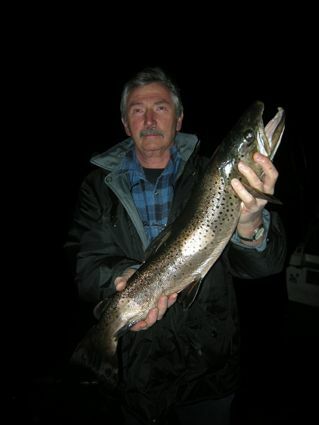 *Andrew Wrobnewski from Sydney caught this very long brown of 71cm on a mudeye at Collingwood bay on a mudeye. The fish only weighed 2.6kg. *Daniella Cooke from Sydney and Peter Palmano had a good time on the lake at Collingwood recently with Daniella landing this very nice rainbow on a mudeye. *Below Banksy with his first ever trout (after seven trips) a 1.1kg rainbow on Powerbait.